Day-of tickets can be purchased at check-in for $15. 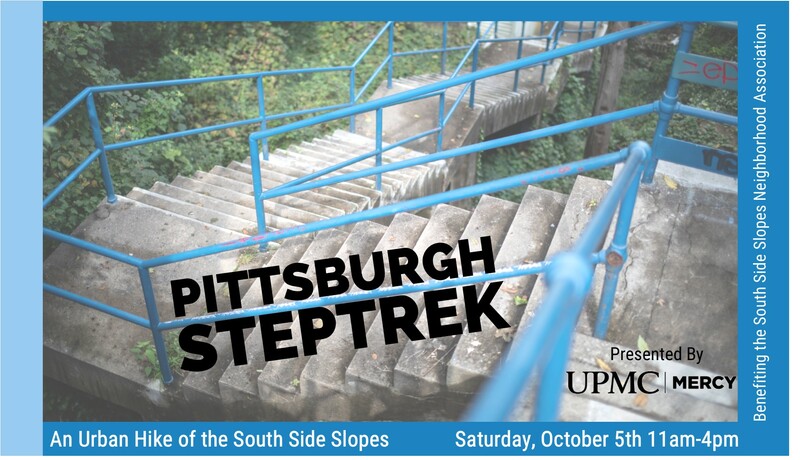 In its 18th year, the Pittsburgh StepTrek will begin Saturday, Oct. 6, 2018 at 11AM at South Side Park (Josephine & 21st Streets). The event has lasted this long due to the backing of individuals with a curiosity as to what lies at the top or bottom of the numerous public stairs in the neighborhood. The routes will take a tour of the hillsides and spectacular views that distinguish Pittsburgh. The family-friendly event combines photography, historic narrative and a sense of a neighborhood dependent upon steps. Waiver: In consideration of this entry, I waive for myself, my heirs and assigns, all claims for damages which I might have against the StepTrek, its sponsors, its beneficiaries or any other business or individuals as a result of any or all injuries which might be received during StepTrek. I also release any photos that may involve me.